THE VETTE NET, Nationwide Corvette Brokerage Network, proud Lifetime Business Member of the National Corvette Museum is pleased to offer a very nice and rare Corvette reminiscent of the late 70s. 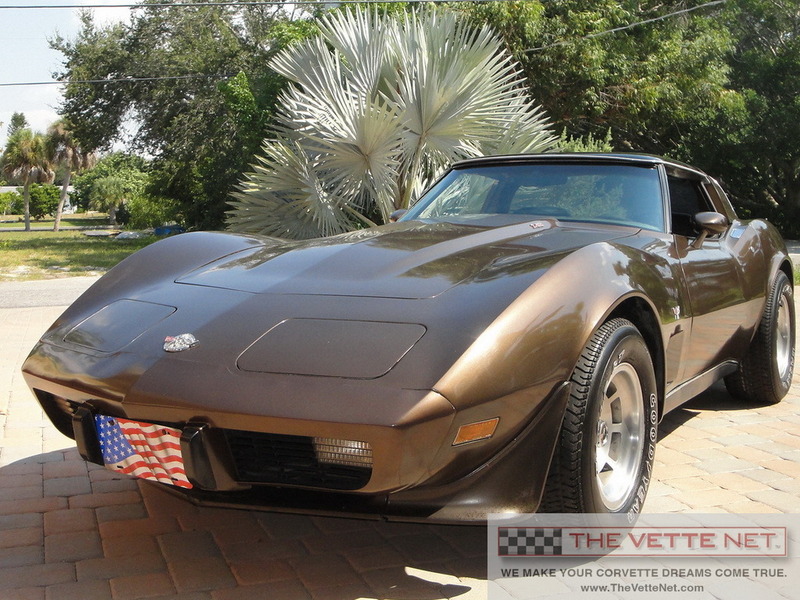 You will be the third owner of this fine example of a 1978 Corvette. Built May 09, 1978 it came to Sarasota FL and was sold to first owner on July 10, 1978 as you see in this warranty form. Second owner got it in May 17, 1979 with 3520 miles and had it ever since. Car was last registered in 1996 and stored properly since. Miles show 21K which are very likely the correct miles on the car, considering its history and condition. It is now back to life in very-nice-to-excellent condition with everything in working order, including even the LOW FUEL light (! ), but not the clock (of course!). It is painted in rare Corvette Dark Brown (code 89) being one only 1991 out of 46779 models built that year. Paint appears to be original and is in very good condition. 692 Dark Brown Leather - 2449/no cost option. Observe that the car is well optioned. As mentioned above, car was waken up after a 14 year sleep and came back to life right away. All it needed was a new battery and it started with no problem. All fluids were checked and replaced, all rubber parts rejuvenated and seem to perform well. Of course, brakes were original and four were replaced with complete new calipers, pads, etc. Originals are available in case car will be judged. Also, a new radiator was installed, original being available too. AC was recharged and blows cold air, tires were original and were replaced with period and size correct GY as pictured. Original 1978 tires are available if need be. All gauges work, vacuum operates as it should, radio, CB, defogger, buzzer, alarm ... all work. We are not aware of the type of tops the car came with since right now it is equipped with Astro Top, a one piece acrylic transparent top which fits very well, looks great on the car and keeps the rain out better that the original T-tops. One can easily procure and install a set of period correct painted or glass tops. All in all, due to its originality, condition and documentation, this Corvette could be judged, shown at car shows and also make a snazzy and reliable driver. In business since 1998, THE VETTE NET has established itself as the premier source for buying, selling and leasing Corvettes, with over 2500 enthusiasts assisted nationwide and international. We are fellow Corvette Club members, we drive Vettes, we live the life-style, and enjoy the hobby. Our Motto is "UnderCommit - OverDeliver" and we guarantee a pleasant and straightforward experience. Do you have a Vette for sale? If yes, you may want to take advantage of our unique FREE marketing program requiring no up-front fee and no exclusivity. Click here to submit your Corvette for sale.